The School building is ok, not too damaged. Two supported children houses are totally damaged and others are partially collapsed. 19 children live in rented house. 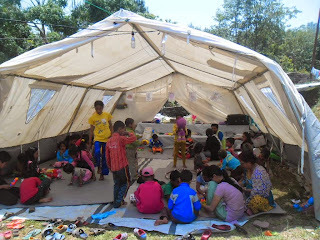 Since the earthquake, all children lived in tents with their family. We gave priority to our supported children though there were around 600 children studying in this school . Other 21 families got relief materials stuffs They were the parents of children from same school. We also done general health check up for 60-70 children and adult . We also distributed medicine cetamol omoprazol jeevanjal, metron Zinc , cough syrup eye ears drops and most of the visitors have blood pressure problem.